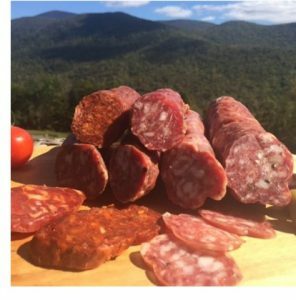 Just in time for all the great autumn get togethers – I have found the Charcuterie Sampler from the fine folks at Fortuna’s Sausage & Italian Market. The collection includes: Finocchiona, a fennel salami; Cacciatorini; Tartufo, Truffle salami; and Abruzesse. About the Charcuterie Sampler from Fortuna’s Sausage & Italian Market. Visit Fortuna’s Sausage & Italian Market online here. Lost Cowboy is powered by	WordPress 5.0.4 and delivered to you in 0.708 seconds using 40 queries.